Dr. John Carroll is principal trumpet of the San Antonio Symphony. He studied piano and trumpet with his father, Ward Carroll, Jr. Weekly lessons began at age 4 1/2 with Mildred Orado, Mrs. Klumpner during high school and Dane Evans at Indiana University. Formal trumpet lessons began at age 14 with Austyn R. Edwards, Ray Makeever, and Ron Modell progressively during high school. John obtained a B.M. in Trumpet Performance and was awarded a Performer's Certificate, by unanimous approval, from Indiana University where he studied with Louis Davidson and Charles Gorham. John's interest in jazz placed him as lead trumpet in David Baker's Jazz Ensemble at I.U., a position he held for eight consecutive semesters. Other teachers include Armando Ghitalla, Thomas Stevens, Ray Sasaki, Roger Voisin, Vincent Cichowicz, Leonard B. Smith, Ray Crisara, John Dewitt, Larry Schmidt, and Rick Giangiulio. John studied conducting with Robert Rustowicz and Eugene Dowdy and composition (emphasis jazz) with David N. Baker and John Mills. He received his Master of Music degree in conducting from the University of Texas, San Antonio in May of 2007 and a Doctor of Musical Arts degree from the University of Texas, Austin in Augus of 2008. Dr. Carroll was previously principal trumpet of the Boston Opera, third/assistant first trumpet of the Springfield Symphony, and fourth/utility trumpet of the Detroit Symphony. He has also played principal trumpet with the Boston Pops Esplanade Orchestra, Columbus Symphony, Sunriver Music Festival Orchestra, Winters Chamber Orchestra, Cactus Pear Music Festival, and is currently principal trumpet with the San Antonio Symphony. 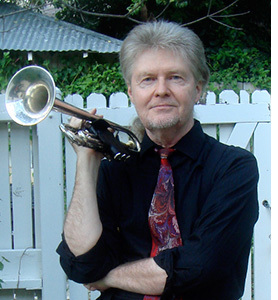 Dr. Carroll is the trumpet instructor at the University of the Incarnate Word and formerly conducted Brass Ensembles and Jazz Ensemble at Our Lady of the Lake University. He is also a founding member of the San Antonio Brass, Inc., a 501(c)3 musical organization dedicated to education through music as well as the preservation of brass literature and performance. John’s other interests include chamber music, composing and arranging, recording and the use of the computer in making music. He has many music making instruments.